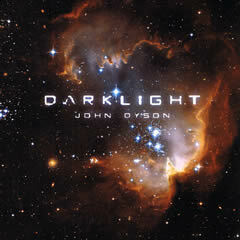 John Dyson is a UK musician specialising in sweeping electronica landscapes, rhythmic and melodic synthesiser music. His music could variously be described as New Age and World music in parts. A founding member of Wavestar, whose first appearance at the UK Electronica festival in 1985 was a sensation, John has now formed his own label Soddett Hall and is forging ahead as a solo artist...still hard ‘at play’ creating not only the music he loves to listen to but also the music that he loves to perform. At this moment I am moving to a new home so at this stage I am unable to process any orders. Meanwhile, there are plans for live shows and more music in 2016. 24 December 2015 - Merry Christmas! Happy Christmas to all the visitors to my website, and all the lovely folk I've met during this year's shows and to supporters both past and present. Sincere thanks to everyone for sticking around and for all your good wishes. It's greatly appreciated. I wish you a fantastic Christmas and all the very best for 2016. 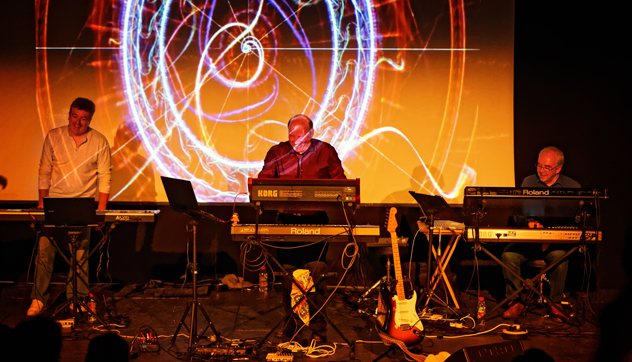 On 3 October 2015, John, Paul Ward and Michael Shipway played the Electronic Circus Festival at The Sommertheater in Detmold (Germany). They had an excellent time thanks to both the organisers (Hans, Frank and all) and the audience, who seemed to join in on the 'emotional link' so to speak...John and the guys are most grateful to all involved as it was both John’s 30th ‘anniversary’ of his first live gig as ‘Wavestar’ with David Ward-Hunt way back in ’85 in Sheffield, and also his ‘first ever’ live performance in Germany. They all say a huge ‘thank you’ to all involved in any way and are most grateful for the welcoming atmosphere at a super event..all credit and power to the organisation. 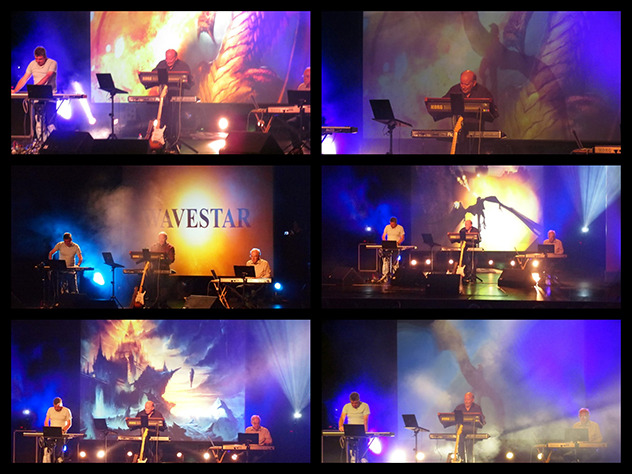 Last Saturday (Oct. 3rd) I attended your wonderful concert in Detmold (Germany). First I would like to thank you for this beautiful show in which you, together with your two collegues, let me hear your wonderful music! I have to confess that I have never heard your name nor your music ever before but I am very thankful for having joined this evening concert. Though I very much like Jean - Michel Jarres music I was very impressed by your music as well. Will check which CD I will buy....! So, thanks again for this much too short concert and letting me hear your wonderful music! I would like to end this mail by wishing you all the strength and perseverance to continue life without your dear friend and to continue producing this very nice music! Not sure if you personally read these mails and this is not something i normally do but after seeing your performance at the Electronic circus last night i felt compelled to write to you. I love all kinds of music and over many, many years and many, many concerts i have seen some of THE great names in popular music. The live performance you gave in Germany was one of the highlights of all those years of watching live music. I have had experiences like that before, but it does not happen very often. It is not just the wonderful music but there was a human connection which goes way beyond the music. I was able to feel your sincerity, your honesty, giving and sharing it all with us to make a true connection and a wonderful emmotional experience. You drew us in, held and captivated us with a fantastic performance. It was obvious to me that all of you on stage were enjoying the whole thing as much as we, the audience, were enjoying it all. Please also pass my sentiments on to Paul and Michael. When i relocated to Germany from the u.k. in 2001 i thought i would never get to see you perform live, but you came to Germany and even so it was an 8 hour round trip it was worth ever second and every kilometre. The piece you played for your departed friend i found very moving. Your friend was correct, you should continue to play it. I'm sure you will never forget him but it is importent to refresh the memory sometimes and to remember the good times with loved ones who are no longer with us. A favourite song of my Father was "wonderful word" by Louis Armstrong and i listen to it often to remind myself of him. That song also reminds me that in our imperfect and troubled world there are still occaisions when we can all connect and experience something special on a much higher leval and last night was truley one of those special moments. Once again, thank you so much, and keep making your very special and wonderful music. 27 August 2015 - Emailed us recently? Please try again! It has come to light recently that gremlins have attacked our email server and we have had to set up a new account. If you've tried contacting John recently via this site, please can you resend your email? The address you'll need is now: johndysonmusic [at] outlook.com, or click this link. Many thanks and apologies for any inconvenience caused. On 30 May, John returned to the stage as part of the E-scape 2015 lineup at The Cut in Suffolk. John decided that rather than try and sum up the experience himself (which he loved, by the way! ), he'd share with you some feedback from an enthusiastic audience member who wrote after the event. 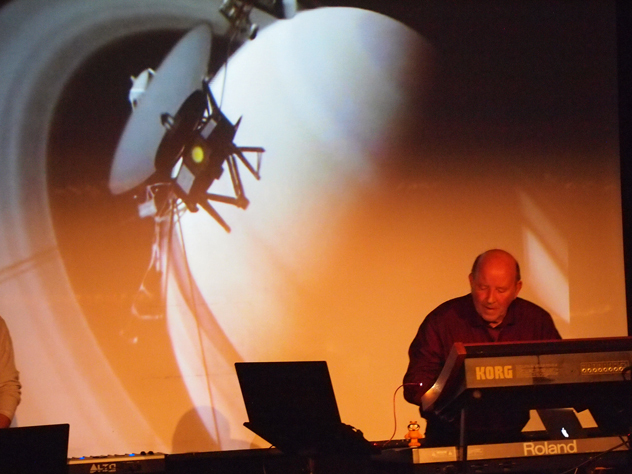 Hi everyone, I recently attended E-SCAPE Electronic Music Festival on the 30th May 2015 at The Cut, Halesworth, Suffolk . Although the attendance was a little low , I enjoyed every minute of the performances by all on stage . I was joined by my father on the day who loved it all . We are both big fans of electronic music and are big fans of David Wright , Robert Fox , Ron Boots , John Dyson , Paul Ward , Andy Pickford , Chris Franke , Johannes Schmoelling , Becky Williams , and Michael Shipway. A massive thank you to everyone involved in organising the event as it was brilliant . The last time I went to a concert like this, was Derby Assembly Rooms way back in 1994 at the E.M.M.A festival . Loved that day too ! I would love to know of any other events like this to be planned for the future in the UK . Wouldn`t miss it for the world !!!! My kind of music...... It was also good to hear music I have never heard of before from Eric Van Der Heijden , Glen Main , FD Project and Dreamerproject who were equally good . At the end of the concert , we both got to talk to Paul, John, Michael, David, Ron and Glen. Very honoured we were too! Good to know you can get to know the performers at the very end of the performance. The Icing On The Cake as they say!!!! Hope to hear from you very soon with news etc.